What is your Distance Delta Course Like? Most people think of a platform like Moodle or a course where you log in, read/study material left by your tutors and write your responses in a discussion forum but never get to talk to anyone. Most distance courses are. Such courses suit many teacher candidates very well. They provide time for individual study and reflection and, very often, rich written communication in the Moodle forums. 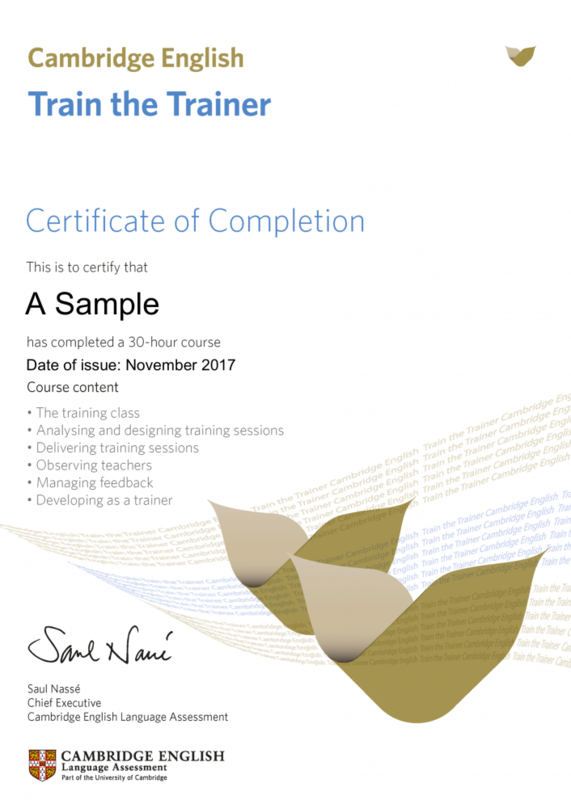 We run such courses ourselves; our ELT Management Course is a prime example of a well run Moodle course. 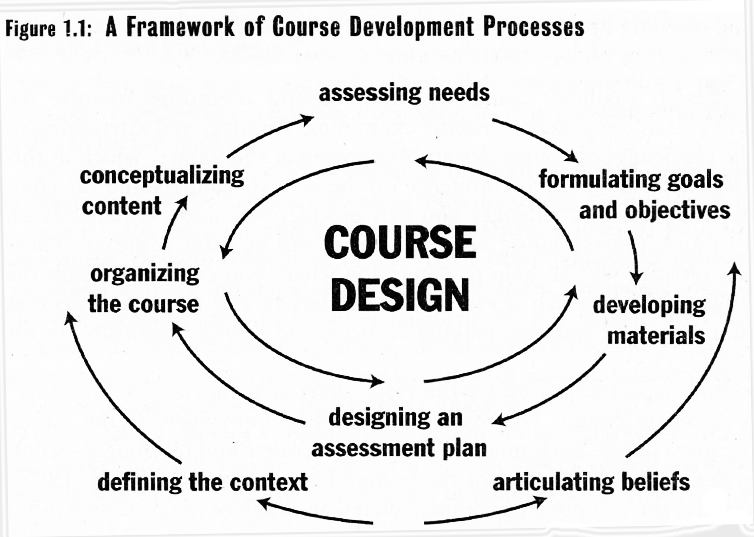 The image above shows the entry page of our Moodle courses platform. But there are those of us who still learn best in a group and perform better in a synchronous instructional setting. Such teachers end up on our face-to-face intensive course and this is ideal for them. There is also a very good argument about learning to teach: that it’s done best by experiencing some good teaching and by trying out activities and approaches in real time. In an asynchronous learning platform, there is no opportunity to do this, unless one videotapes oneself – but what transpires very often is that even if this is an option, few people have enough time in their working lives to actually sit down and watch colleague videos and provide feedback. The answer is of course that to practice teaching you need to follow a live class! You need to see others teaching and be seen teaching! There is no other way around this. Can everyone leave job and/or family for 8-9 weeks? But what about those who cannot stay away from work for the two months which are usually the norm to complete an intensive Delta modular course? Our solution, which we launched in 2012, was to offer the course in a synchronous interactive environment, an online platform that allowed immediacy and audio and visual interaction with all our trainees and the tutor, of course. These were major affordances and we found them all in the Adobe Connect Pro platform which we have now been using regularly for more than 5 years. The online ‘leg’ of the course lasts 24 weeks for those who register for all three modules. Screenshots of two recent Delta groups – as you can see every single students can have audio and video – not just the tutor. On our online course, participants get to see, hear and interact with their tutors, of course, as well as with their fellow participants, teachers from all around the globe, each one bringing to the session and the course a unique background and teaching experiences. Our online classroom is cutting edge technology and allows even groupwork! We can ‘send’ our trainees to different ‘breakout rooms’ to collaborate via text. audio and video and the option to share decisions and findings! 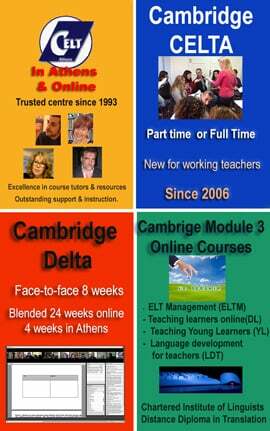 Visit our web page here https://celtathens.com/delta/distance/ for more details on this online option and more information about other platforms that we use to support our trainees’ learning and professional development. Online trainee from Canada, currently working in Egypt, teaching for one of her Module 2 assignments in Athens. Each of the four assignments includes a background essay, a lesson plan, teaching the lesson and writing a short reflection. For candidates who have been able to work regularly throughout the 24 weeks of the online leg of the course, these 4 weeks can be reduced to 3 and for candidates living nearby, this part of the course can be completed over three or four visits. During the course, candidates are also given input for a variety of Module 3 specialisms but they must choose one for their Module 3 assignment. Their focus must be something they can implement with a real class. Module 3 options though are a separate topic which I hope to deal with more extensively in a future post. CELT Athens is a top destination for high quality Cambridge Delta courses and our alumni list includes people in top academic positions around the globe.